Tesla Model S shooting brake gets closer look in video | Car News, Reviews, & Pricing for New & Used Cars. Remember that Tesla Model S shooting brake we told you about a few months ago? No, not that Dutch-customizer version, which has yet to see the light of day, so far as we can tell. We’re talking about the wagonized version from British outfit Qwest Norfolk. The finished version was just featured in a new episode of U.K. YouTube show Fully Charged. 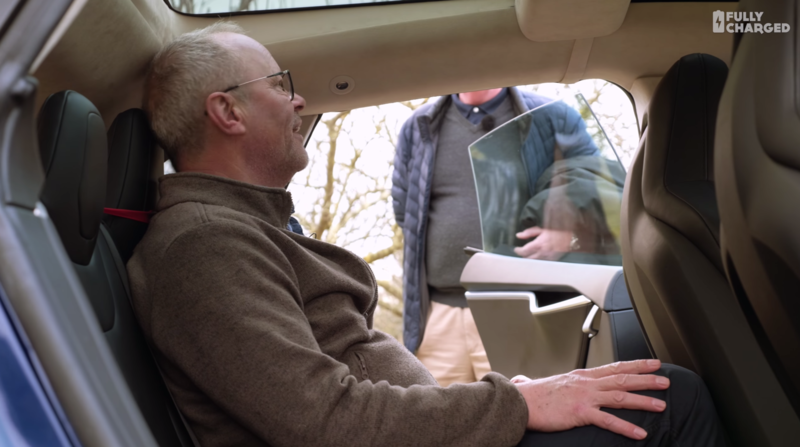 Host Robert Llewellyn and guest @TeslaTed devote considerable attention and a leisurely drive to the latter’s modified four-wheel-drive P90D version from model year 2015. Among the notable findings are new details about price, a suspicion that the changes actually resulted in a quieter interior and a weight savings of 12 kilograms (26.5 pounds), thanks to all that carbon fiber making up the new hind quarters. Tesla even reportedly kept the car’s original warranty after inspecting the modification work. Qwest added a second panoramic sunroof and a Qwest badge, though it drops the Tesla “T” logo from the liftgate. It added two body side moldings, left and right, plus a rear goal post, but they used the original Model S rear fascia panel and brake lighting on the hatchback. Inside, it retains the car’s original roofline for the expanded moonroof. We’ll note that despite a reported 3 inches more headroom, Llewellyn’s head appears to come right up against the headliner where it meets the moonroof, suggesting that headroom in back is tight — though he also acknowledges he has to slump down in the backseat of his production Model S E85, so … improvement? The modification will start at $84,000 and take about 10 weeks to allow for cutting the rear off the Model S, assemble the new lift gate and rear end, waiting for the bond to happen, fit the rear glass and moonroof and do final finishing work. Veteran head designer Dorian Hindmarsh says the team has even mocked up a wood-paneled version in CAD designs, a la a ’70s station wagon. “The great thing about this conversation is that you don’t have to use a brand new car, and you choose what flavor Model S you want to use. You can get a really leggy old one,” @TeslaTed, the shooting brake’s owner, says in the video. He also thinks the conversion looks better than the original Model S. Feel free to agree or disagree in the comments.